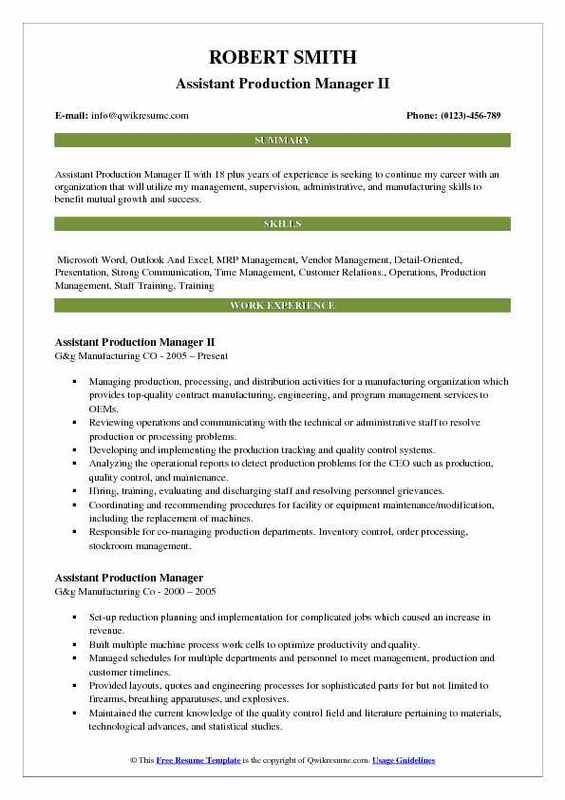 Assistant Production Manager renders support to the production team by undertaking some or all of the following job roles and responsibilities – monitoring effectiveness of production processes, coordinating employees, handling quality control, overseeing manufacturing team, ensuring products are manufactured on time, creating timescale for production, adjusting schedules, procuring and monitoring use of production equipment, and checking product standards. The assistant production managers are also expected to check product standards and apply for quality control programs, liaison with clients and complete the paperwork as assigned by the production manager. 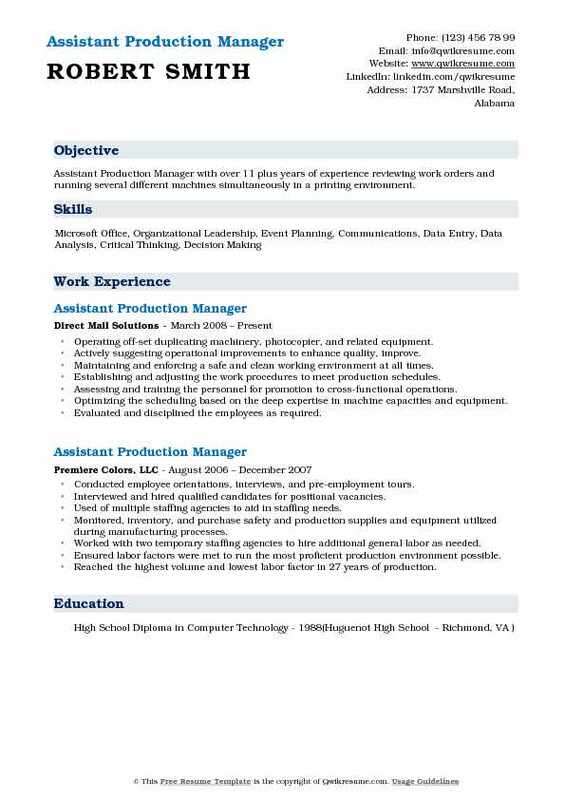 Candidates looking out to work as assistant production managers should mention in the Assistant Production Manager resume skills such as the flexibility to work under stringent deadlines, analytical and people skills. The incumbent should have enough manufacturing processes experience and be able to operate various equipment and applications. To work in this position, a Bachelor’s degree in the field of Engineering or the related is expected on the resume. 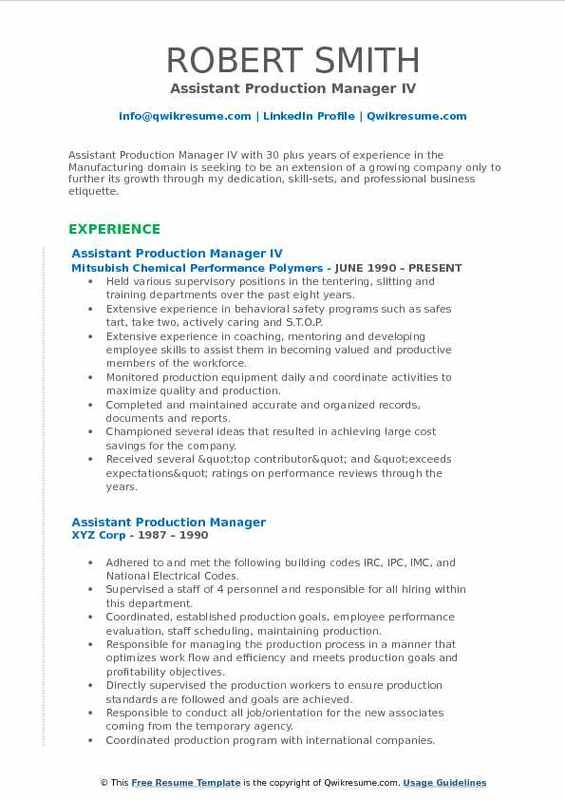 Summary : Assistant Production Manager with 13 years of experience is seeking a position, where my education, experience, and personality will provide growth and support to an organization. Was the first point of contact for all new contracts and clients. Organized meetings and arranged for walk-through of our facility. Organized production schedule of employees to match the needs of customers and goals of the company. Purchased trims as relevant to the industry. Processed all paperwork for proper invoicing and payment. Worked closely with the Bookkeeper and CPA to ensure all paperwork is handled correctly. Coordinated production planning among owner, customers, production supervisor and assembly line machine operators (up to 90 employees). Filled out and maintained OSHA logs for work related accidents and responsible for staying in compliance. Prepared for yearly audit in garment compliance industry. 100% success rate. Also, handled all workers compensation investigations. Helped gather information and worked close with state labor commission agency to resolve legal matters. Worked with different vendors to obtain the best quality and prices of services or products needed. Researched and analyze new projects coming in and communicate procedures to follow to staff. Summary : Assistant Production Manager with 10 years of experience in the Manufacturing domain and the ability to demonstrate flexible and efficient time management and to appropriately prioritize workload based upon the organization or department needs. Skills : Machine Troubleshooting On Tetra Pak Mach, Straw Applicator, Shrink Mach. & Processing Equipment, Computer Literate, Knowledge On Motor Control, Electrical Wiring. Oversaw the production supervisors coordinates with other departments and sections to achieve production requirements. Monitored all standard operating procedures for compliance and ensured that all operators were following the proper processes and procedures. Ensured that products and assemblies were made to print and are labeled to the highest quality standards. Monitored and educated all employees on safety policies and procedures. Aligned headcount/manpower and arranged flexibility training and cross-train operators based on required skill. Worked with the manufacturing team to analyze and solve workflow problems to maximize efficiency and product output. Effectively managed, developed and motivated direct and indirect reports. Responsible for all aspects of performance management including interviewing, hiring, training, performance evaluations and recognition. Provided constructive and appropriate feedback and leadership to direct reports to foster positive, team atmosphere and ensure personal and professional. 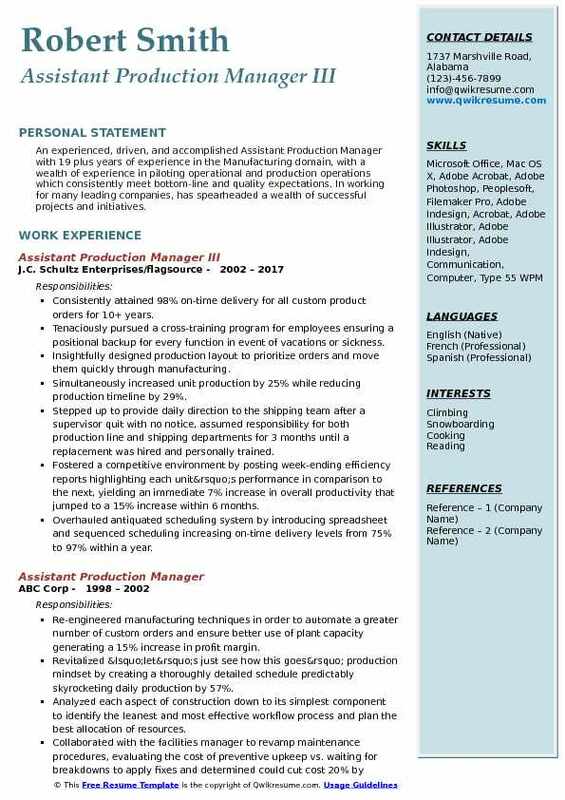 Summary : Assistant Production Manager II with 18 plus years of experience is seeking to continue my career with an organization that will utilize my management, supervision, administrative, and manufacturing skills to benefit mutual growth and success. Managing production, processing, and distribution activities for a manufacturing organization which provides top-quality contract manufacturing, engineering, and program management services to OEMs. Reviewing operations and communicating with the technical or administrative staff to resolve production or processing problems. Developing and implementing the production tracking and quality control systems. Analyzing the operational reports to detect production problems for the CEO such as production, quality control, and maintenance. Hiring, training, evaluating and discharging staff and resolving personnel grievances. Coordinating and recommending procedures for facility or equipment maintenance/modification, including the replacement of machines. Responsible for co-managing production departments. Inventory control, order processing, stockroom management. 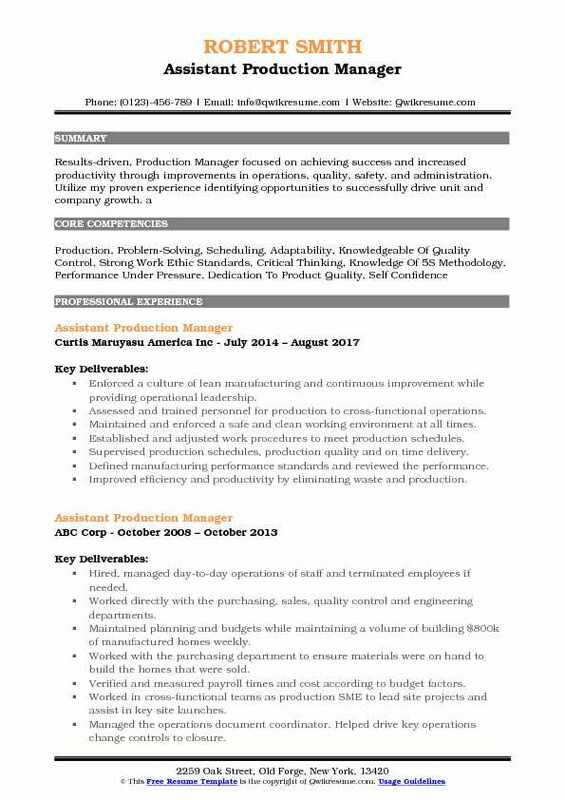 Summary : Assistant Production Manager IV with 30 plus years of experience in the Manufacturing domain is seeking to be an extension of a growing company only to further its growth through my dedication, skill-sets, and professional business etiquette. Held various supervisory positions in the tentering, slitting and training departments over the past eight years. Extensive experience in behavioral safety programs such as safes tart, take two, actively caring and S.T.O.P. Extensive experience in coaching, mentoring and developing employee skills to assist them in becoming valued and productive members of the workforce. Monitored production equipment daily and coordinate activities to maximize quality and production. Championed several ideas that resulted in achieving large cost savings for the company. Received several "top contributor" and "exceeds expectations" ratings on performance reviews through the years. 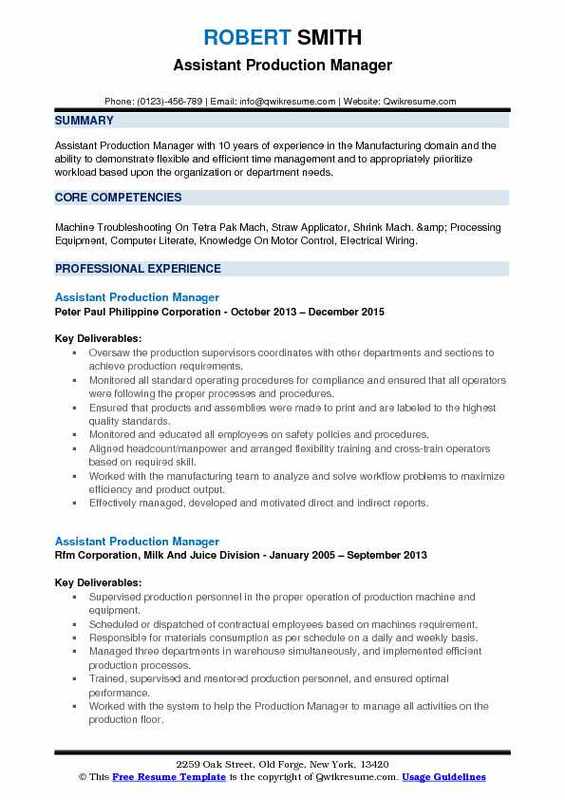 Summary : An experienced, driven, and accomplished Assistant Production Manager with 19 plus years of experience in the Manufacturing domain, with a wealth of experience in piloting operational and production operations which consistently meet bottom-line and quality expectations. In working for many leading companies, has spearheaded a wealth of successful projects and initiatives. Consistently attained 98% on-time delivery for all custom product orders for 10+ years. Tenaciously pursued a cross-training program for employees ensuring a positional backup for every function in event of vacations or sickness. Insightfully designed production layout to prioritize orders and move them quickly through manufacturing. Simultaneously increased unit production by 25% while reducing production timeline by 29%. Stepped up to provide daily direction to the shipping team after a supervisor quit with no notice, assumed responsibility for both production line and shipping departments for 3 months until a replacement was hired and personally trained. Fostered a competitive environment by posting week-ending efficiency reports highlighting each unit’s performance in comparison to the next, yielding an immediate 7% increase in overall productivity that jumped to a 15% increase within 6 months. Overhauled antiquated scheduling system by introducing spreadsheet and sequenced scheduling increasing on-time delivery levels from 75% to 97% within a year. Implemented the theory of constraint principles to reduce inventory levels by 48%, decreasing carrying cost and escalating cash flow, while maintaining excellent service. 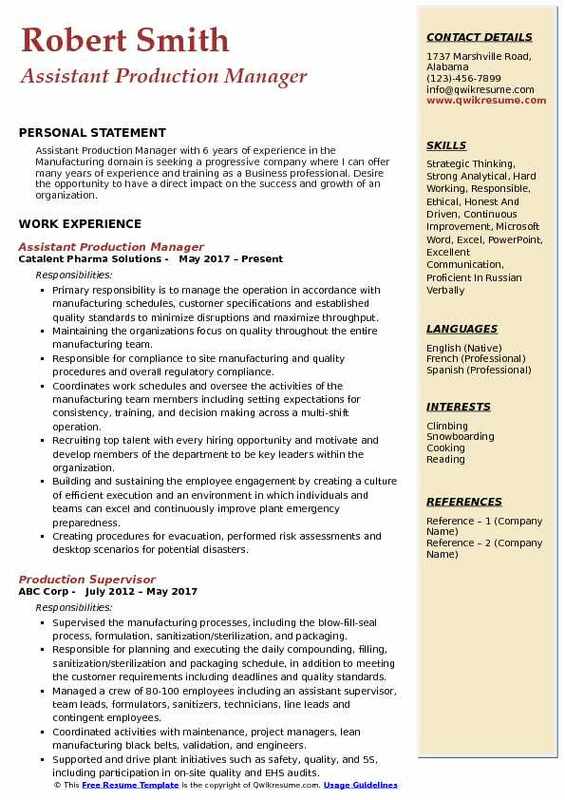 Summary : Assistant Production Manager with over 11 plus years of experience reviewing work orders and running several different machines simultaneously in a printing environment. Operating off-set duplicating machinery, photocopier, and related equipment. Actively suggesting operational improvements to enhance quality, improve. Maintaining and enforcing a safe and clean working environment at all times. Establishing and adjusting the work procedures to meet production schedules. Assessing and training the personnel for promotion to cross-functional operations. Optimizing the scheduling based on the deep expertise in machine capacities and equipment. Evaluated and disciplined the employees as required. Regulated, evaluated, and implemented the employee operations, technological, and safety training courses. 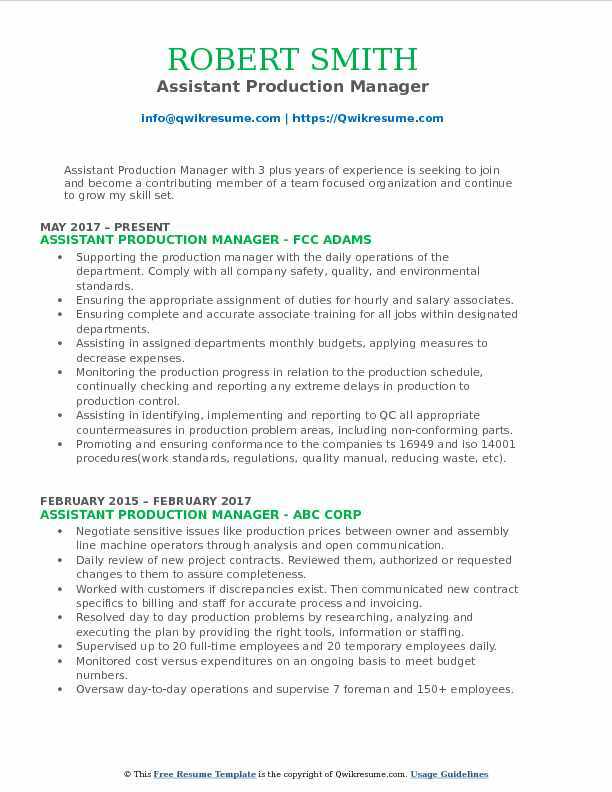 Objective : Assistant Production Manager with 3 plus years of experience is seeking to join and become a contributing member of a team focused organization and continue to grow my skill set. Supporting the production manager with the daily operations of the department. Comply with all company safety, quality, and environmental standards. Ensuring the appropriate assignment of duties for hourly and salary associates. Ensuring complete and accurate associate training for all jobs within designated departments. Assisting in assigned departments monthly budgets, applying measures to decrease expenses. Monitoring the production progress in relation to the production schedule, continually checking and reporting any extreme delays in production to production control. Assisting in identifying, implementing and reporting to QC all appropriate countermeasures in production problem areas, including non-conforming parts. Promoting and ensuring conformance to the companies ts 16949 and iso 14001 procedures(work standards, regulations, quality manual, reducing waste, etc). Effectively communicating with management, direct supervisor, and associates. Reduced scrap from 18% to 7% and continuing to implement countermeasures. Assessed and trained personnel for production to cross-functional operations. Defined manufacturing performance standards and reviewed the performance. Improved efficiency and productivity by eliminating waste and production. Collaborated with the engineering team to adjust and modify production. Developed and maintained strong and clear communication and rapport with management personnel. 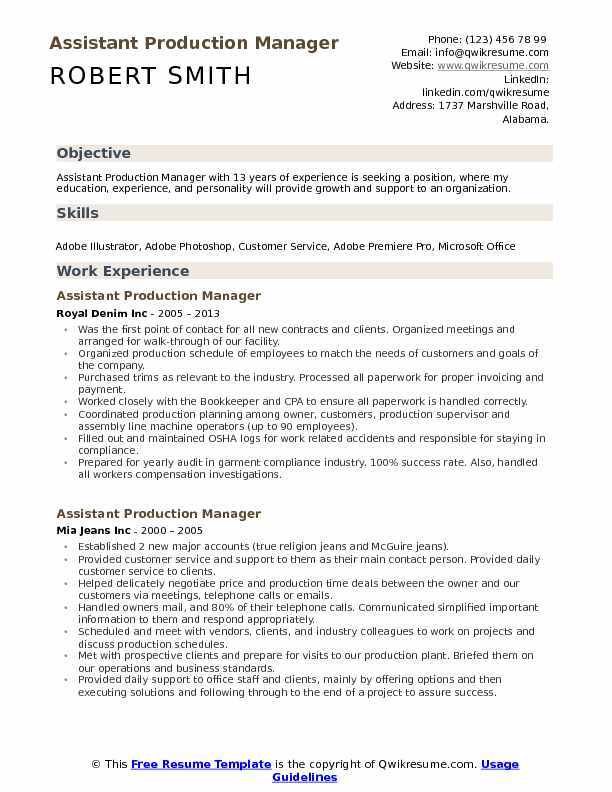 Headline : Assistant Production Manager with 6 years of experience in the Manufacturing domain is seeking a progressive company where I can offer many years of experience and training as a Business professional. Desire the opportunity to have a direct impact on the success and growth of an organization. Primary responsibility is to manage the operation in accordance with manufacturing schedules, customer specifications and established quality standards to minimize disruptions and maximize throughput. Maintaining the organization's focus on quality throughout the entire manufacturing team. Responsible for compliance to site manufacturing and quality procedures and overall regulatory compliance. Coordinates work schedules and oversee the activities of the manufacturing team members including setting expectations for consistency, training, and decision making across a multi-shift operation. Recruiting top talent with every hiring opportunity and motivate and develop members of the department to be key leaders within the organization. Building and sustaining the employee engagement by creating a culture of efficient execution and an environment in which individuals and teams can excel and continuously improve plant emergency preparedness. Creating procedures for evacuation, performed risk assessments and desktop scenarios for potential disasters. 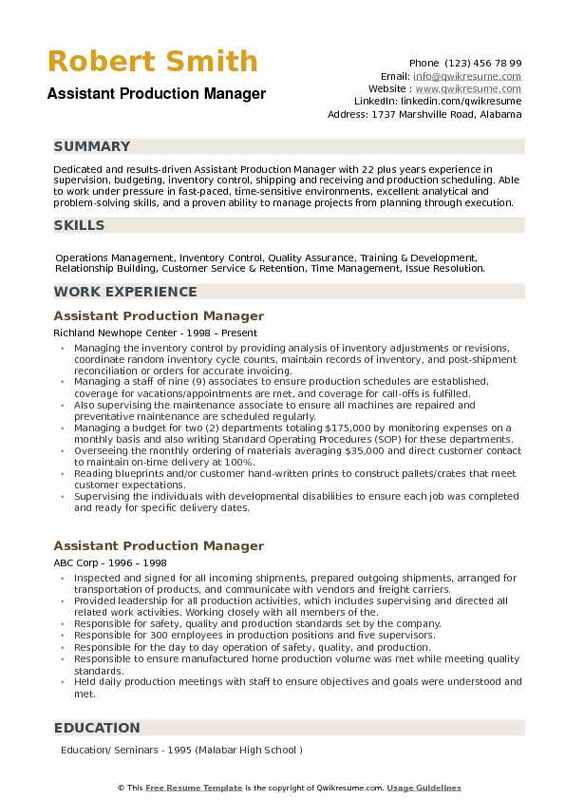 Summary : Dedicated and results-driven Assistant Production Manager with 22 plus years experience in supervision, budgeting, inventory control, shipping and receiving and production scheduling. Able to work under pressure in fast-paced, time-sensitive environments, excellent analytical and problem-solving skills, and a proven ability to manage projects from planning through execution. Skills : Operations Management, Inventory Control, Quality Assurance, Training & Development, Relationship Building, Customer Service & Retention, Time Management, Issue Resolution. Managing the inventory control by providing analysis of inventory adjustments or revisions, coordinate random inventory cycle counts, maintain records of inventory, and post-shipment reconciliation or orders for accurate invoicing. Managing a staff of nine (9) associates to ensure production schedules are established, coverage for vacations/appointments are met, and coverage for call-offs is fulfilled. Also supervising the maintenance associate to ensure all machines are repaired and preventative maintenance are scheduled regularly. Managing a budget for two (2) departments totaling $175,000 by monitoring expenses on a monthly basis and also writing Standard Operating Procedures (SOP) for these departments. Overseeing the monthly ordering of materials averaging $35,000 and direct customer contact to maintain on-time delivery at 100%. Reading blueprints and/or customer hand-written prints to construct pallets/crates that meet customer expectations. Supervising the individuals with developmental disabilities to ensure each job was completed and ready for specific delivery dates.